[redacted] is a game of intrigue and espionage. Intel is located and retrieved. Players radio for extraction via helicopters, which can be blown up by their enemies. Probably. You see, at the beginning of [redacted], you have no idea where everybody’s loyalties lie. Adding to the confusion, encounters are double-blind, so only the two players involved in it know everything that happened, and sometimes even they’re left clueless. The upcoming Garden Party expansion adds some exciting new elements to [redacted]’s already engaging bluff-your-way-to-victory-and-hope-you-don’t-blow-up-your-teammate’s-helicopter experience. Before I talk about the Garden Party expansion, let me take a minute to brief those of you unfamiliar with [redacted]. 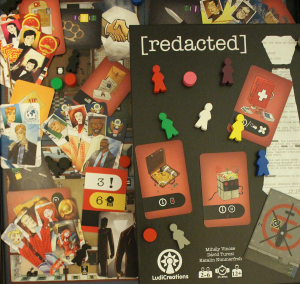 [redacted] is a game for 2-6 players designed by Mihály Vincze, Dávid Turczi, and Katalin Nimmerfroh. Each player takes on the role of a spy and is assigned a loyalty – the UK, the USSR, the USA, or China. If playing with a fifth player, Interpol gets involved. Anyway. Players are trying to find their enemy’s intel and escape with it, or make sure their opponents don’t escape with theirs. Enter the spectacular blowing up of helicopters! A player can move and perform one action on their turn. If you perform an action, say dispose of illicit contraband, your turn ends. If you choose to move, you can move through as many rooms as you want, provided they are open and available. Assuming you’re not injured, as long as you can trace a path to your desired destination, you can go there. This freedom of movement is particularly helpful since there are three floors available for you to sneak about on: the terrace, the ground floor, and the basement. I suppose I should mention that you can continue to move as long as you don’t encounter another player. When that happens, you have an interaction, and interactions can go any number of ways. Interactions use that double-blind system I was talking about earlier. This means that only the two people engaging in the altercation (or not) know what happened. Sometimes nothing happens, and both players decide to walk away. One of them may decide to be friendly, giving their opponent an item or providing first aid. Maybe everyone’s getting along today, and both players swap items. Of course, the lives of spies aren’t all bubbles and sunshine (or indifference, as the case may be); there is also combat. If one player chooses to attack the other player, who foolishly thought they were going to have a friendly interaction, the attacking player automatically wins. If one player attacks and their opponent chose to play a neutral card, the aggressor still wins but both players have the option to play combat items (and possibly get to some loot or info). If both players throw down, they play combat cards to see who wins. The combat system is like a much more aggressive rock, paper, scissors. Of course, spies don’t have time for the games of children; they go big, or they go home – and going big involves awesome weapons. Instead of rock, paper, and scissors, players are using brass knuckles, knives, and garrottes. Like I said, awesome. Some of the rooms are cooler than others. There are rooms that contain nothing but art on walls. There are rooms that let you scan players who walk through certain types of doors; scan, by the way, means you get to sneak a peek at that player’s items. Some rooms allow you to acquire new weapons. Others let you heal. It all depends on where you choose to go. Your team wins if they meet the win condition of the mission you’re playing. Your team loses if they don’t. Easy peasy. Garden Party is designed by the same people as [redacted] and adds a seventh player to the game, now making it 2-7 players. It does a bunch of other cool things as well. To begin with, Garden Party adds a new board. The ambassador has decided to get fancy and will be hosting a fireworks display as well. There are ten new locations in the Garden, which function in the same way as rooms do in the main house; they may be locked, equipped with x-rays, or be plunged into darkness if someone cuts the Breaker. Sometimes, lovely things happen in the garden, like at the Fountain. If a player so chooses, they may summon all of the guests to the Fountain to watch the firework display. Isn’t that thoughtful of them? They knew you didn’t want to be in that musky armory anyway. Not all the locations are similar to the rooms inside the house. Take the Garbage Drop. It lets you draw the top two cards from the discard pile and keep one. 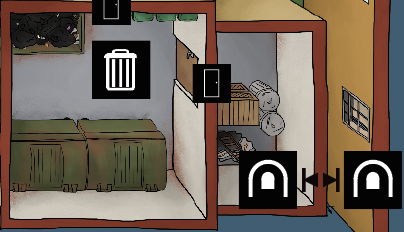 Next to the Garbage Drop is a Tunnel Exit, which is like a Staircase but cooler because it’s a tunnel. 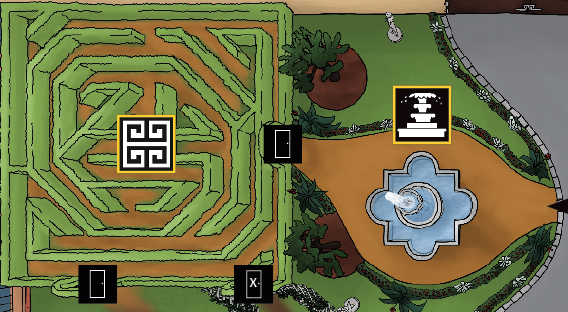 Garden Party gives players several new options during gameplay. For example, a player may choose to start in the Patio instead of the Entrance. If a player prefers not to leisurely stroll through the gardens, they have the option to hightail it out of there in the ambassador’s Aston Martin DB5. Oh, you can still blow up the car as you would a helicopter, but who would blow up such a classic piece of machinery? Exactly. There are several new missions added in the Garden Party expansion, including one you can use with the Mercenaries expansion. The missions include explosions, busting would-be bombers, sneaking people through tunnels, and planting surveillance devices. If you want to add more intrigue and espionage to your gaming, be sure and check out Garden Party. Garden Party is now on Kickstarter. Missed your chance to back [redacted] the first time? Worry not! You’ll be able to back the base game as well during the Kickstarter campaign. To be notified when it launches, sign up for our newsletter: http://ludicreations.com/newsletter.